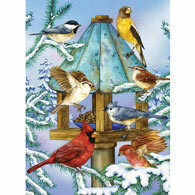 Christmas Sleigh Ride is a 1000 piece jigsaw puzzle designed by artist Ruane Manning. A family rides in a horse drawn Sleigh though a covered bridge as the now is gently falling. Friends and neighbors stop at the edge of the road to wave a greeting as they pass by. Available in two piece counts.